People who get plenty of sun exposure do not require supplemental vitamin D, since sunlight increases vitamin D synthesis when it strikes bare skin. Although the recommended dietary allowance for vitamin D is 200 IU per day for adults, there is some evidence that elderly people need 800 to 1,000 IU per day for maximum effects on preserving bone density and preventing fractures. Sun-deprived people should take no less than 600 IU per day and ideally around 1,000 IU per day. In adults, vitamin D deficiency may result in a softening of the bones known as osteomalacia. This condition is treated with vitamin D, sometimes in combination with calcium supplements. Osteomalacia should be diagnosed, and its treatment monitored, by a doctor. In people of any age, vitamin D deficiency causes abnormal bone formation. In addition, vitamin D deficiency can cause muscle weakness, which improves with vitamin D supplementation. Vitamin D deficiency occurs more commonly following winter, owing to restricted sunlight exposure during that season. Living in an area with a lot of atmospheric pollution, which can block the sun's ultraviolet rays, also appears to increase the risk of vitamin D deficiency. Vitamin D deficiency is more common in strict vegetarians (who avoid vitamin D-fortified dairy foods), dark-skinned people, alcoholics, and people with liver or kidney disease. People with liver and kidney disease can make vitamin D but cannot activate it. Vitamin D deficiency is more common in people suffering from intestinal malabsorption, which may have occurred following previous intestinal surgeries, or from celiac disease. People with insufficient pancreatic function (e.g., those with pancreatitis or cystic fibrosis) tend to be deficient in vitamin D. Vitamin D deficiency is also common in individuals with hyperthyroidism (Graves' disease), particularly women. In children, vitamin D deficiency is called rickets and causes a bowing of bones not seen in adults with vitamin D deficiency. Vitamin D deficiency is common among people with hyperparathyroidism, a condition in which the parathyroid gland is overactive. In a study of 124 people with mild hyperparathyroidism, vitamin D levels were below normal in 7% of them and suboptimal in 53% of them. Vitamin D deficiency is also common in men with advanced prostate cancer. 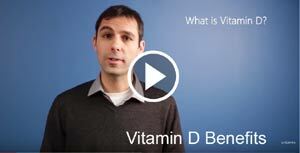 In one study, 44% of 16 men with advanced prostate cancer had decreased blood levels of vitamin D.
One in seven adults has been reported to be deficient in vitamin D. In one study, 42% of hospitalized patients under age 65 were reported to be vitamin D deficient. In this same study, 37% of the people were found to be deficient in vitamin D, despite the fact they were eating the currently recommended amount of this nutrient. Vitamin D deficiency is particularly common among the elderly. Age-related decline in vitamin D status may be due to reduced absorption, transport, or liver metabolism of vitamin D.
Vitamin D increases both calcium and phosphorus absorption and has also been reported to increase aluminum absorption. People with hyperparathyroidism should not take vitamin D without consulting a physician. People with sarcoidosis should not supplement with vitamin D, unless a doctor has determined that their calcium levels are not elevated. Too much vitamin D taken for long periods of time may lead to headaches, weight loss, and kidney stones. Rarely, excessive vitamin D may even lead to deafness, blindness, increased thirst, increased urination, diarrhea, irritability, children’s failure to gain weight, or death. Most people take 400 IU per day, a safe amount for adults. Some researchers believe that amounts up to 10,000 IU per day are safe for the average healthy adult, although adverse effects may occur even at lower levels among people with hypersensitivity to vitamin D (e.g. hyperparathyroidism). In fact, of all published cases of vitamin D toxicity for which a vitamin D amount is known, only one occurred at a level of intake under 40,000 IU per day. Nevertheless, people wishing to take more than 1,000 IU per day for long periods of time should consult a physician. People should remember the total daily intake of vitamin D includes vitamin D from fortified milk and other fortified foods, cod liver oil, supplements that contain vitamin D, and sunlight. People who receive adequate sunlight exposure do not need as much vitamin D in their diet as do people who receive minimal sunlight exposure. Some, but not all, research suggests that vitamin D may slightly raise blood levels of cholesterol in humans.